Born in Port Hedland, Wendy moved to Melbourne when quite small. Her Father played folk music and the whole family would enjoy old favourites such as “Stir the Wallaby Stew”, “Morton Bay” and “The Dying Stockman” igniting an early interest in music, but she probably got her vocal qualities from her mother and her grandfather who used to rumble away harmonising with whatever music was in his vicinity. Wendy would listen to what he was doing and tried to emulate him very early on and has since been fascinated and delighted by harmony. Ealey easily slots into the Folk Roots genre, particularly according to those who are not traditional Folk aficionados. Others of her supporters will say 'Nonsense! Surely you're a blues singer!' When it comes to keen exponents of folk music she has been described as ‘almost beyond the pail’. She herself hasn't a clue and is happy to sing and play anything that gets her in the solar plexis. She has been compared with Joan Baez, Joni Mitchell, Kathy Mattae, Edith Piaf, Judith Durham, Deborah Warne, Janis Ian, Eva Cassidy, Lucinda Williams and numerous others. To her great disappointment no one has ever said she sounds remotely like Annie Lennox. Ho hum. Wendy performs with Moira Tyersin the duo “Ealey & Tyers” playing a mixture of original and borrowed material, from tongue in cheek renditions of popular 'lurve' balads to moving tales of loss or grumpy women of a certain age commentary, supported by well crafted instrumental and vocal arrangements. As a solo artist she has a very different relationship with the audience from the experience of playing in a group. Much more intimate and in some ways more spontaneous. Her song writing stretches from the very personal to bitingly satirical. 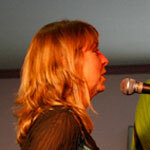 For over a decade she has been involved in fostering the song writing talent in the Northern suburbs of Melbourne as a coordinator of the Darebin Music Feast Songwriters Award and a co-founder of the Darebin Songwriters Guild as well as coordinating and MCing the Maldon Folk Festival Roddy Read Memorial Songwriters Award. Although recently retired from the Feast Songwriters Award, she continues to co-convene the Guild and organise and present the Roddy Read Memorial Awards. Wendy shares her Melbourne home with her family mainly comprising three cats, Abby, Russet and Sniper, and Alfred the 13 inch tall guard dog— all of these close relatives being discerning critics and valued advisors in matters musical and sartorial. 2012 Cygnet, Tamar Valley Folk and Newstead Live Music Festivals with ‘Unsung Heroes of Australian History’ theme concerts with Moira Tyers, Bruce Watson and Neil Robertson. Ealey & Tyers Newstead, Chandelier Room, Clifton Hill, Hills Folk Club Perth, private functions. Workshops with Te Toa Matoa from Kiribati. UHAH whirlwind tours of SA, Canberra, NSW. Played the Indian Pacific and presented to the National History Teachers Association Conference in Perth. Mentoring songwriters and musicians. 2011 Tamar Valley Folk Festival. ‘Unsung Heroes of Australian History’ theme concerts with Moira Tyers, Bruce Watson and Neil Robertson at Maldon Folk Festival, Launched UHAH CD. Ealey & Tyers Gigs at Clifton Hill Hotel. Houses concerts. Darebin Songwriters Guild, Darebin Music Feast Songwriters Awards and Maldon Folk Festival’s Roddy Read Memorial Songwriters Award. Solo performances, MC work. 2010 Tamar Valley Folk Festival. Narrated and performed in ‘Unsung Heroes of Australian History’ theme concerts with Moira Tyers, Bruce Watson and Neil Robertson at the National Folk Festival. Gigs at Clifton Hill Hotel, The Boite, Melbourne Folk Club, Clare Castle. Houses concerts. Continuing involvement with Darebin Songwriters Guild, Darebin Music Feast Songwriters Awards and Maldon Folk Festival’s Roddy Read Memorial Songwriters Award. Backing vocals on Brent Parlane’s album ‘This Wonderful Parade’ and Bruce Watson’s ‘Balance’ album. Solo performances, MC work. 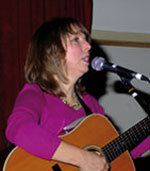 Formed new duo called “Ealey & Tyers” with music buddy Moira Tyers. 2009 Cygnet Folk Festival, Tamar Valley Folk Festival. Performing and MCing the Sunday Sounds at the Royal Talbot fundraising event. Basin Music Festival. Recorded ‘Mudcake’ album with Unsung. Brief tour of United Kingdom and Denmark - particular highlight being warm up act/support to Alan Oslen - Denmark’s answer to Bob Dylan. To quote the English translation of the Danish promotion blurb: “Wendy Ealey has the biggest voice out from Melbourne and will be making it hot for Alan Olsen.” Does it get better than that one wonders... Continuing involvement with Darebin Songwriters Guild, Darebin Music Feast Songwriters Awards and Maldon Folk Festival’s Roddy Read Memorial Songwriters Award. 2008 Cygnet Folk Festival, Tamar Valley Folk Festival. Rehearsing, recording and performing with Unsung. Appeared with Unsung at Port Fairy Fringe, Brunswick and Basin festivals, Hardiman’s Clifton Hil Hotel, and various venues. Continuing with Songwriters Guild. Backing vocals for Neil Robertson’s new album, Leticia Maher’s new album for ‘09 release and Ben Witham’s album. Solo gigs. 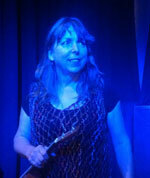 Appeared in ‘Quiet Achievers - Unsung Heroes of Australian History’ inaugural performance. 2007 Baw Baw Festival, appearances with Unsung. Launch of second album “Out of the Shower” at Wesley Anne. Maldon Folk Festival. Darebin Music Feast Songwriters award, coordination, MC etc. Rehearsing and performing with Unsung. Backing vocals for Malcolm T’s CD ‘11th Hour’. Backing vocals for Neil Robertson’s CD ‘Wake up the Dead’. 2006 Recorded CD at Spring Studio with Harry Williamson, helped along by some of the most generous and kind musicians one could hope to meet. Started up the Darebin Songwriters Guild with Moira Tyers (her brainchild as it happens), MC-ing, organising Guild events, and sometimes popping up for a sing. Appearances with Jess Evans, young local songwriter as accompanyist of dubious instrumental scope. Maldon Festival performing, conducting harmony workshops, and judging the Roddy Read awards and had a bumper year with the Music Feast Songwriters Award in September, formation of Unsung. 2005 Backing vocals on Malcolm Turnbull’s (well The MT, the politician is ‘that other one’ in all fairness. Malcolm got here first) CD “Dabbling in Philosophy”. Performances include evening at Club Feast, singing with the Victorian Trade Union Choir for Refugee Day celebrations. 2004 Recorded first CD at LaTrobe University music studios. Songwriting and singing coaching, continued involvement with the Darebin Music Feast Songwriters Award as organiser and MC, Poetry Festival Monsalvat. Member of Folk Victoria management committee. 2003 Finalist, International UniSong Songwriting Awards with song “Clues”. MC at Victorian Trade Union Choir CD Launch. Collaboration with Victorian Trade Union Choir, performing “Sense of Place”. MC of Darebin Music Feast Songwriters Award finals concert, member of the Darebin Music Feast steering committee. Appearances at East Brunwick Folk Club, Ringwood Folk Club, Australia Day celebrations at Bundoora Historic Park, Twickenham Folk Club, London, backing vocals on Malcolm Turnbull’s (The MT) “Goodness how the years have flown” retrospective CD. “…the Carlton Courthouse was used to magnificent effect with the effort of very fine lighting by Peta Hanrahan and the magnificent contralto of Wendy Ealey who sang so moving a rendition of the 23rd Psalm that for a moment my lapsed soul stirred.” Geoffrey Milne, The Age 1991 1988-1991 Performing ‘corporate comedy’, writing parodies and material based on information supplied by the client for product launches, Christmas parties etc. 1990 “The Nurseryman’s Jingle”: Retail Nurseryman’s Association’s advertising campaign. 1989 “In the Shadow of The Chimneys”: co-wrote, arranged, directed, performed and recorded theme for award winning documentary. 1987 Stand up comedy/singing performances in the “Vaudevillains” comedy club in Brixton. Backing singer in rock and roll band, London. 1982-1985 Session singing in Melbourne and London. National Theatre Drama School. Attended and later graduated from the school. During this time developed comedy characters “Helga Vulga” and “the Nurseryman”. 1979-1981 Witchwood Close: Acoustic trio, appearing at folk clubs around Melbourne. 1977-1978 Carter Haugh: Traditional folk duo with Chris Pain appearing at folk clubs and festivals. Recorded track ‘North Country Maid’ on Green Man Live Album. 1976-1979 Solo folk singing accompanying self on guitar, appearing at all the old faithfuls such as Outpost Inn, Troubadour, the Green Man, One-C-One, Commune, festivals and concerts. tennis, reading, sloth.